Sea Bubble Shooter. Dive into the ocean and go on an underwater adventure! Your task in this cute Bubble Shooter with a twist is to clear the star in the center of the rotating field. Aim carefully and match at least 3 same-colored bubbles to pop them. Collect golden shells and buy powerful upgrades which can help you master difficult levels. Can you unlock all areas and earn 3 stars in every level? This game can be played on all devices. This game is one of the match 3 games at Round Games. 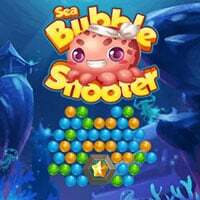 Sea Bubble Shooter is a free online game on RoundGames.